by Merrigan, Gerianne; Huston, Carole L.
Effective argumentation is at the very heart of communication and a key component to understanding and conducting communication research. Using clear language, concrete examples, and the Toulmin model of claim-data-warrants, Communication Research Methods introduces students to multiple ways of knowing, helps them think critically about communication, and provides them with the tools they need to explore the often murky depths of communication research. 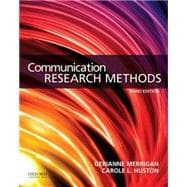 Ideal for research methods courses covering multiple methodologies, this is the only text that uses a research-as-argument approach to help students become not only more effective researchers, but more insightful consumers of research. Gerianne Merrigan is Professor of Communication Studies at San Francisco State University. Carole L. Huston is Associate Provost and Professor of Communication Studies at the University of San Diego. 5. What Counts as Communication Data? » Emphasis on Context in Analysis?